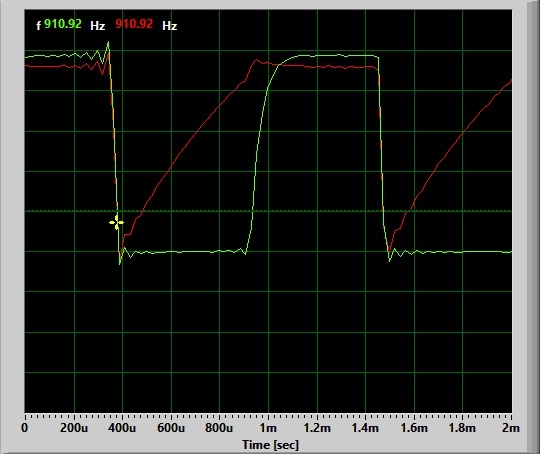 What can a Sound Card Oscilloscope do for you? In this article I'm going to demonstrate the signals that you can observe in an astable multivibrator circuit. I'm going to modify one of the projects that I posted here a little while ago and I'm going to use the sound card oscilloscope from my book called Sound Card Oscilloscope - Build Better Electronics Projects to examine the waveforms. If you don't want to build yourself a cheap oscilloscope yet that's ok because this article is about showing you what you will be able to do when you do have one. 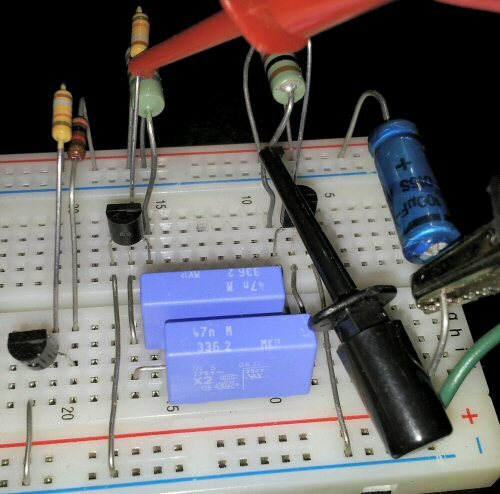 I'm going to use a circuit similar to the one I showed you in the article How To Build An Astable Multivibrator Circuit Without Solder. I've modified it slightly to make it oscillate at a higher frequency and removed the LEDs because you can't see them flash at that speed. I've also added a 100µF electrolytic capacitor to decouple the power rails and minimise the unwanted electrical noise. 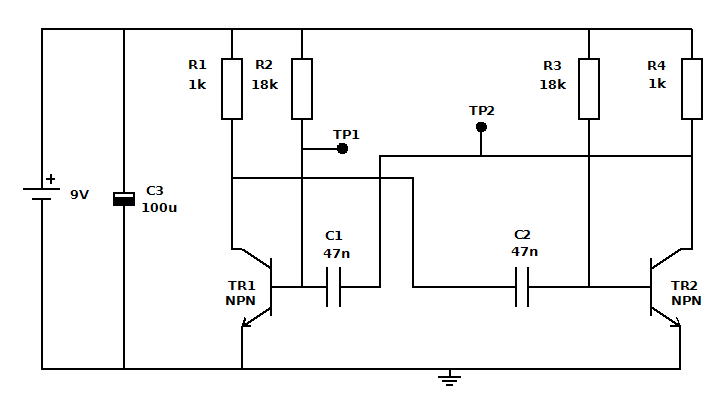 The transistors I used are both BC547 but just about any general purpose NPN BJT transistor would do such as 2N2222 or BC108. All wired up and ready to go. This is where I get out the Sound Card Oscilloscope and attach the common lead to the ground of the circuit or the emitter of one of the transistors. I then attached one of the Oscilloscope probes to TP1 and the other to TP2. Now run the software application, connect the battery and observe the oscilloscope display and you will see something that looks like a square wave and a sawtooth type of signal. Adjust the positions of the traces to see them clearly together and turn on the digital display of frequency displayed in the top left corner of the display. The calibrator can then be used as described in the book, to calibrate the verticle display of the oscilloscope to 1V per division which provides a convenient scale for measuring by eye. Providing that the window is not resized the scaling will remain. Counting the divisions on the oscilloscope I can see that the amplitude of the square wave is approximately 4.9V peak to peak. So the calculated frequency is 857Hz but the measured frequency is 911Hz. It's about 6% different so why is that? Well the frequency does depend to some extent on the supply voltage and all my components are at best only within 10% of their marked values so 6% is quite close. You can see quite clearly from the screenshot of this display that the capacitor attached to the base of each transistor goes sharply negative as the opposite transistor switches on. It then disharges slowly through the 18k&ohm; resistor until it reaches the forward conducting voltage of the transistor. The sound card oscilloscope is only capable of AC coupling which means that it is not possible to measure absolute voltages directly but you can get an idea of what is going on by using a multimeter switched to DC volts. 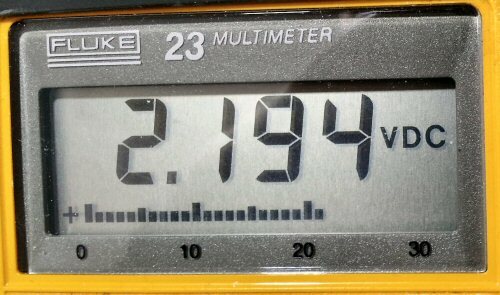 Measuring DC volts between ground and TP2, the collector, reads 2.194V. This is the average reading of the waveform. If the signal were perfectly square with a 50% duty cycle then the reading would be half of the peak to peak voltage plus a few millivolts for the collector-emitter voltage when the transistor is switched on. If you look closely at the waveform you will see that the voltage stays low for a little longer than it is high which accounts for the lower than expected DC voltage reading. 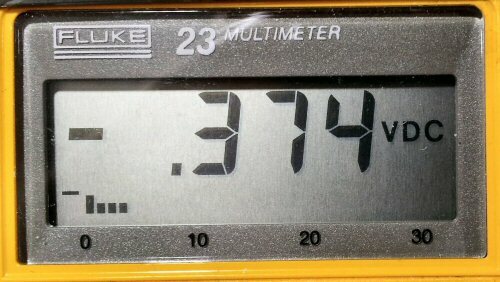 Measuring the DC voltage at TP1 shows -0.374V. A negative reading. This is because the signal spends roughly half of it's time below the base threshold voltage or 0.6V. So you can see that by using the Sound Card Oscilloscope together with a cheap multimeter you can do some quite sophisticated measurements. And I haven't even mentioned that you can also analyse the frequency spectrum of the signals. I will leave that one for you to do. Now go and buy my book Sound Card Oscilloscope - Build Better Electronics Projects and build a cheap oscilloscope for yourself.